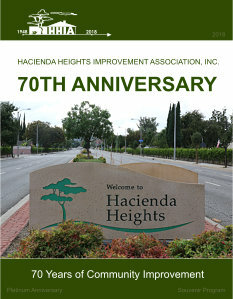 About Us | HACIENDA HEIGHTS IMPROVEMENT ASSOCIATION, INC.
1. To foster and support those projects of improvement and development that will make Hacienda Heights a better place in which to live, and to do all things lawful and necessary and needful in connection therewith. 2. To develop and foster proper zoning and land use in the Hacienda Heights Unincorporated Community, assist the Los Angeles County Regional Planning Commission, and the Board of Supervisors, in studies, zone change requests, and other matters pertaining to land use in our area. The 12 member Board of Directors of HHIA is elected by the members of the association. Each member is elected for a two year term, and may serve three consecutive terms. Four members are elected annually. Any member of the association may seek election by placing his/her name on the ballot during the fall months. Applications may be requested from the President and candidates will be expected to express their interest and views in serving on the Board. The election is conducted by mail ballots which are counted by five members during the annual meeting in January. Our regular meetings (open to the public) are on the third Monday of the Month at 7 p.m. at the Hacienda La Puente Unified School District Board Room with the exception of January (the Annual Meeting / Dinner- all members) and the fourth Monday in February due to the Presidents holidays. 4. Defeat of proposal to construct a trash incinerator in the hills above Seventh Avenue. 10. Proposed conceptual plans for screening unsightly block walls along Hacienda Blvd. 20. Restoration, maintenance and increased use of the Puente Hills for recreation, hiking and biking.